Pretty soon Tim was thinking, “Why not?” After all, he’s one of the few guys — working for himself, by himself — who actually can take off a whole summer. And besides, it was his teenaged son’s idea. That was what was really cool. So now it’s a plan. Tim and Jonny have spent much of the winter and spring plotting, refining the route, warning friends and relatives and near-strangers that they’ll be dropping in looking for food and shelter (and maybe laundry once in a while). They’ve been working on their lists of what they’ll need and where they’ll go and what they’ll do when they get there. Many cities — and people they wanted to visit — have been scratched because of time constraints. But it’s still an ambitious undertaking: eight-plus weeks, and 8,000-plus miles. They’ll leave Ridgewood after school ends in late June, and take the northern route west through Pennsylvania, Ohio, and Indiana, up into Wisconsin to see grandparents, down through Illinois for more grandparents and the Fourth of July, and then across the Great Plains to the Rockies. After a few days in Denver and higher up in northern Colorado’s Front Range, they’ll make their way through the mountains to northern California. Down the coast to southern California, then east toward Las Vegas and the Grand Canyon. Across the Southwest and Texas, through Memphis and Nashville, and then they take a left in North Carolina and come up the Eastern Seaboard to be back in Ridgewood for Labor Day. Tim and Jonny hope they’re coming to your town on this trip, but if not, feel free to get in touch and come along for part of the ride. They’re happy to pick up hitchhikers at any airport (or bus station, for those who prefer to ride the Dog) in one city along the route, and then drop them off at another city further on. Check the other links here, as they go up, for more on the itinerary. When they actually hit the road, Jonny and Tim plan to update this site regularly with reports and pictures of their progress. And they’ll welcome your e-mails in the “Your Comments” section before, during and after the Big Summer Trip 2002. Here’s the route: more than 11,000 miles over 60 days (and nights), with only 11 of those nights in motels. We spent the rest with friends and relatives, some of whom Tim hadn’t seen in years and some neither of us had ever met before. We rolled out of Ridgewood at 8:28 a.m., and Jonny gave me a high five. Nancy and Ben Wisch, Cameron’s dad, (Cameron is going with us through Peoria, the first 11 days) were there to send us off amid hugs and handshakes, but we knew it was a true moment in family history when Lizzie got out of bed to say goodbye. We stopped several times, and took a wander off Interstate 80 into Amish country. We had lunch in a tiny place called Rebersburg, Pa., in the combnation hardware store-grocery-deli-bait shop where the woman behind the counter made us sandwiches and let us eat them outside at the curb. After a sucession of cell phone calls and some confusion — who knew there were two junctions where I-80 meets PA State Hwy 220, both with McDonalds’? — we hooked up briefly with Cherrie, Amanda and Doug Bagwill, and their boat. We chatted for a few minutes, and headed off in opposite directions. We got to the Bagwill home in Upper St. Clair, Pa., clearly one of the swell parts of the Pittsburgh area, where Bill was keeping the Yuengling cold, around 5:30 p.m. We knocked off the road dust, went out for dinner at a beer-and-wings joint, and then Bill and I sat on his front porch in rocking chairs with nightcaps and cigars. All in all, a rousing start, though I hope that I do not drive as many miles in one day ever again, especially in the next two months. 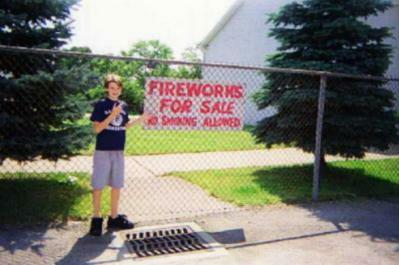 Cameron snapped Jonny outside the Wholesale Fireworks warehouse in Hubbard, Ohio, where a security guard asks if you have any matches or lighters before you can get in. When you buy your fireworks, a clerk checks your out of state driver’s license, and you have to sign something promising not to blow them up in Ohio or any other state where they are illegal. “Course, they’re illegal everywhere,” the clerk says. Right. Bill and I went out early for a run and bagels, and after breakfast Cameron and Jonny took turns racing around the Bagwills’ South 40 on their riding mower. Then we hit the road around 9:30, making our first stop in Hubbard, Ohio, where the Wholesale Fireworks warehouse left the boys literally trembling. We loaded up the car to the point that it is now a rolling arsenal. If Volvo had equipped its vehicles like this in World War II, we’d all be speaking Swedish now. We spent much of the afternoon at the Rock ‘n’ Roll Hall of Fame in Cleveland, and then ducked into the USS Cod, the sub that killed so many enemy ships in the Pacific 1943-45. We went across town to what is probably the only house in Cleveland with a large Menorah and the Grateful Dead skeleton in the front windows (different windows), the home of Ray Hallenstein, who was Ray Hall back when we went to high school. 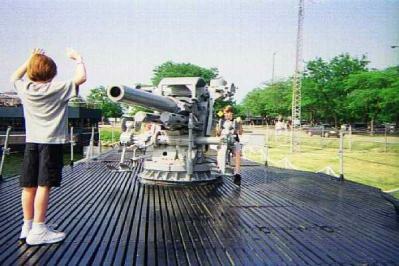 Jonny wheels and lowers the big gun and gets the drop on Cameron on the deck of the USS Cod, a WWII sub moored in Cleveland on the Lake Erie shore next to the Rock ‘n’ Roll Hall of Fame. Ray and his wife Chris were delighted to show us around their amazing house, with its incredible assemblage of mementoes, debris, collections, rubbish, treasures, and projects. It’s hard to keep track of which is which. We talked with their three kids, went out for pizza, and then Ray and I sat up late on the patio — he said there had been a patio under all that stuff in his yard at least the first few years they lived there — and had cigars. I sense a pattern developing for this trip, and it is not objectionable. Odometer: 188 miles today, 635 total. Chris went out for bagels and we again left around 9:30. We made good time and got to the Indiana Dunes, a place I had always wanted to visit, just as a rainshower was ending on I-80 around four o’clock. What a disappointment. We could drive along the dunes and the sparkling Lake Michigan beaches below, but we couldn’t find a place to park. The National Park Service was shutting down lots and telling people to come back another day. We briefly considered staying nearby and visiting the dunes the next day, Monday, but decided against it for a number of reasons, including the apparent lack of any good places to stay in the area. As a barely satisfactory consolation, we went to Splash Down Dunes, which claims to be the biggest water park in the Midwest. We spent much of Sunday evening in Chicago traffic, but after being revived by the Mars Cheese Castle (ham & cheese, brat, hot dog), we surprised Nancy Peterson and David Ryser by arriving at their place in Milwaukee just as they were returning from a weekend with the kids at their lake house. They decided to let us stay the night, so we did. Nancy and I sat up on the front porch for a while, sans cigars, after David, a known co-conspirator in Cuban trade who is ordinarily eager to help destroy evidence by burning it up, apparently fell asleep putting Morgan and Evan to bed. Such is the exhausting life of a lakemeister. Cameron and Jonny sacked out in the basement in front of a big TV, begging to be allowed to sleep in at least a little. No 9:30 departures tomorrow, I promised. Remember my whining about driving so much on Friday? Odometer: 502 miles today, 3-day total 1,137 miles. After a run along the lakefront, I joined the boys for breakfast on the front porch at David and Nancy’s, and we spent the afternoon at Summerfest, one of the great traditions of Milwaukee. We braved Milwaukee rush-hour traffic to make it to Brookfield, where Nancy’s folks had dinner ready for us. It was a quiet evening, except for the boys tearing around the neighborhood on their scooters and then setting off a few fireworks when it got dark. I had a run through the leafy suburb of Brookfield, and then was corraled into trying to Roto-Till Paul’s flagging garden. I are not a farmer. He finally let me give up, and I think he will be applying for federal disaster assistance on the grounds of negilgent abuse of agriculture. The boys and I had a great couple of hours at a jewel of a little park nearby, swimming in an old quarry where Nancy used to sneak in to swim at night when she was a kid. We went back to the folks’ place on Bonnie Lane for lunch and packing, and got to Steve and Jane’s in Madison in time to make a trip to the University of Wisconsin’s Union Terrace for a pitcher before coming back to barbecue. Odometer: 107 miles today; 4-day total 1,244 miles. Heading south out of Madison, we stopped at a place outside Beloit, Wis., that promised “Cheese — Fireworks — Gifts” and somehow came away with more explosives. The lady at the counter talked me into the $40 special Shogun package, then had me show her my New Jersey driver’s license and fill out the various forms. “Sign here,” she said. “This says you know the laws of your state and will abide by them.” Then she laughed real loud. Jonny climbed into the backseat with Cameron, and for the next half hour they counted the fireworks — 418 rockets and other aerials, so far, not counting the smoke bombs, firecrackers, pinwheels, sparklers, cherry bombs and other groundworks — and talked about fuses linking them up for multiple launches. We detoured a few miles to have lunch at Top Dogs, a roadside stand in Paw Paw, Ill., pop. 850. We had shakes, a cheeseburger, a hot dog and a chili dog. Nothing tasted anything like the stuff you get from McDonalds, Wendys or Burger King. Over lunch we debated possible nicknames for the Paw Paw High School sports teams. Feel free to send us a guess, or post it on the comments section. We stopped at a filling station and asked somebody on the way out of town, and we’ll reveal it here in the journal in a few days. We got into Peoria on the afternoon of July 3, ending the first part of the trip — five days, five one-night stops. We’re here for five days, then Jonny and I head west again. Cameron goes home, and we’ll miss him. Odometer: 215 miles today; 5-day total 1,459 miles. It was a quiet day in Peoria and then BOOM! no it wasn’t. We spent the very hot day at my folks’ cottage on the Illinois River, and then just as evening was coming on and the boys were getting out all the fireworks, my old friend Larry Layman, the cop, showed up with even more fireworks that he had confiscated from some other poor kids. Jonny and CamerBOOM! proceeded to entertain the small BOOM! crowd of us at the cabin well past dark. It was a BOOMING! day. Even more importantly, everybody still had the number of fingers they started with. This was a high school reunion weekend, starting with lunch at Jim and Carol Bitner’s new condo in Morton. We compared notes about living in Europe, and about dealing with aging parents. Very boomer-ish. At my folks’ cottage and at various Peoria night spots I caught up with John Hanson, Mike Roeder, Denny & Denise Marks, Cal & Becky Quast, and other old cronies. A lot of people, I had trouble recognizing them, but as soon as I did, I found myself saying, hey, you haven’t changed a bit. Sadly, we put Cameron and Nancy, who had come out to Peoria for the long weekend, on a bus to Chicago to catch a plane home to New Jersey. 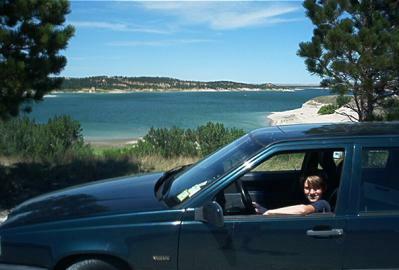 Gladly, Jonny and I got back into our familiar positions — “Back in the saddle,” he said, riding shotgun again — and pointed the Volvo west. We crossed the Mississippi at Rock Island, and just outside Davenport, Iowa, we saw an F1 indoor racekart track. An hour later, we got back in the car and it seemed like we were going incredibly slowly. 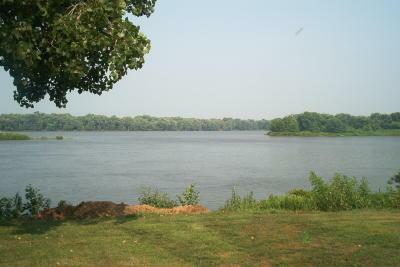 This is the view from the porch where Larry and Bernie Fruhling watch the Mississippi, and life, roll by in a very relaxed fashion. The island is Sneaker Island, so named after a fisherman a few years back found a sneaker there — with a foot in it. It was all that was ever found of a woman who had jumped off a bridge in Dubuque. We meandered up the Iowa Great River Road, checked out Sabula, the only island “city” in Iowa, and landed for the night in Bellevue, Iowa, at the very relaxed riverside chalet where Larry and Bernie Fruhling have retired. Larry said he had a Rotary meeting, and asked me to be the guest speaker. Why not. I talked about beer, and then we went and had a couple. And then we went onto his porch, had a couple more, smoked a couple of Cubans, and watched the Mississippi roll by under the moonlight. Back in the saddle indeed. Odometer: 185 miles today; 1,863 miles for the trip. We drove two-lane state and county highways from Bellevue to Iowa City, where we had a roadside lunch and caught up with Chuck and Pam Schoffner. Interstate 80 again, then, into Des Moines, where newlyweds Bob and Ellen Modersohn tore themselves away from their honeymoon long enough to have some old friends over and barbecue. Yes, there was beer. And yes, cigars. Life on the road could be worse. Odometer: 249 miles today; 2,112 miles for the trip. 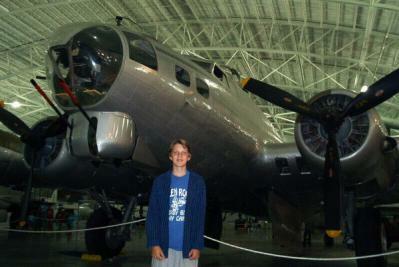 There are lots of cool planes, rockets, missiles and bombs at the Strategic Air Command Museum outside Omaha, but we had no trouble picking one to be in the photo: the B17, the old Flying Fortress, was the unanimous family favorite. Our lucky 13th day on the road, and what a day it was. We left Des Moines around 8:30 a.m. amid thunderstorms that got worse — or better, from our point of view, with spectacular lightning — as we crossed the western half of Iowa. Outside Omaha, we spent a couple of really good hours and then had lunch at the Strategic Air Command Museum (thanks Aunt Amy Bobrowitz for the suggestion). After departing from our tentative itinerary by spending only one night in Des Moines, we set off across Nebraska toward the Badlands, most of the miles on Nebraska State Highway 2, a two-lane road through the Sand Hills. It was a long and really good drive (thanks to Larry Fruhling for the suggestion) that was remarkably pretty, especially as we drove into the marvelous light of a clear summer evening and the shadows lengthened on the many greens and browns of the hills and dunes. We settled for the night in Alliance, Nebraska — that is Mountain Time, for those of you setting your watches by us — and got a room in a motel for the first time on the trip. Jonny set a new record, among the more than two dozen long trains we saw — 165 cars, with four engines. Odometer: 564 miles today; 2,676 miles for the trip. We were three weeks late for the Solstice, but that didn’t stop auto-maniac Jonny from climbing up on an old Buick and welcoming the new day at Carhenge, just north of Alliance, Nebraska. 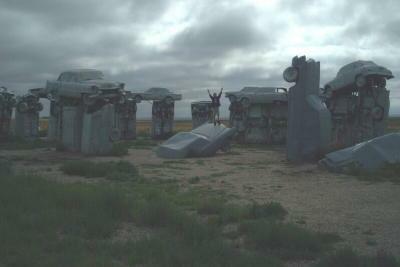 A couple of miles north of Alliance we found Carhenge, which is what Stonehenge would have looked like if Druids drove Dodges: old cars stuck into the ground and balanced on high in the exact form of the real Stonehenge. A little farther up the road we came to a Nebraska rest stop: bales of hay with an old swivel arm chair and a toilet (not connected to anything) perched on top. In Chadron, Nebraska, we found the Museum of the Fur Trade remarkably interesting, especially with all the 1810 re-creators passing through in their Old West clothing on the way to a trappers’ “rendezvous” nearby. In Wounded Knee, South Dakota, we saw the field where the massacre — “battle,” the army called it — happened in 1890, when troops cut down close to 200 Indian men, women and children. We also visited the Wounded Knee cemetery and several other Indian heritage sites in the area. We got up close and personal enough to count their nose hairs at Mount Rushmore, but Jonny still was skeptical when Tim kept telling him they were John, George, Paul and Ringo. 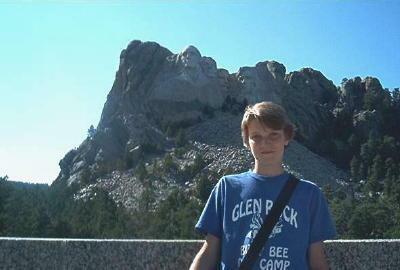 Jonny did some nifty navigating and took us into Mount Rushmore the back way. At one point, on a road full of switchbacks and beautiful views, he suddenly ordered, “Stop the car!” We got out, climbed a rockface (he helped me up) and magically, right there across the valley, was a great view of The Heads. How did Jonny know that? “I just thought we would be able to see it from there,” he shrugged. We went on a tour of the monument itself with a good National Park Service ranger, and then headed south, stopping at the Crazy Horse memorial on the way. There’s been a lot of progress made since I first heard about this maybe 20 years ago, but there’s still a long way to go. It costs $18 to get in, see it from a distance and get access to the huge gift shop. Back on the road, it wasn’t far to Custer, South Dakota, where we stayed in another motel just off the main drag. After dinner, I asked the guy in the grocery store if I had to buy the entire six-pack of Heineken (the only one in the store). He looked confused, then panicked, and stared at the $7.99 pricetag. “I can help with the math,” I offered. “Two beers would be $2.67.” He looked relieved, said thanks, and rang up the two beers. “Are you a math teacher?” he asked. Odometer: 301 miles today; 2,977 for the trip. Here’s Jonny behind the wheel shortly after his first time driving on this trip — or ever — when he drove through and around the town of Manville, Wyoming. We saw the lake in the background as we passed Glendo, Wyoming, so we stopped for a swim. Custer has one of the best running/biking paths in the world running parallel to the main drag, and I took advantage of it early in the morning for about five miles, when the temperature was 70 and the relative humidity 30. What a way to start the day. We scored some model cement for Jonny to use on the model planes he is acquiring and building along the way. Heading south on back roads, I took a break to eat some nuts in the passenger seat while Jonny drove through and around Manville, Wyoming, a couple of miles in all. As we were passing a huge and beautiful lake formed by the dam near Glendo, Wyoming, we saw a sign for a state park and pulled in for a swim at a long sandy beach where people drove right up to the water, backed in to unload their JetSkis and motorboats, and then parked their SUVs right there. One SUV got stuck in water up to the doors, but another pulled it out. We had a pit stop in Chugwater, Wyoming, but Jonny didn’t want a T-shirt. We left Ridgewood two weeks ago today. In Denver we stayed with Mike and Dianne (Sauder) Jacobsen, who live in a cool little house tucked away like a country retreat right in the middle of the city. Great food, even better talk, and they had some Fat Tire beer to help wash down a cigar. A police helicopter circled overhead for a while, shining its spotlight down on the neighborhood; since it’s so dry that most of the Fourth of July fireworks were canceled in Denver, we figured they heard Jonny was in town and were trying to locate the Volvo carrying contraband rockets, firecrackers and other explosives. Odometer: 402 miles today; 3,379 for the trip. Here’s your faithful scribe at Uncle Bill and Aunt Shirley’s in Red Feather Lakes, on the deck with all the bear-paw scratches on it. They took down the hummingbird feeders that were attracting the bears, but as I was working (75 degrees, low humidity, soft breezes rustling the pines and aspens) the hummingbirds kept coming around looking for the feeders, and a couple of them kept flitting up to those flowers on the table, just a few inches in front of me. Well, we all gotta work sometime, somewhere. A beautiful crisp morning in Denver led, unfortunately, into yet another hot dry afternoon without the shower at three or four o’clock that always seemed to cool off Denver in summers past. Dianne took us to the Air Force museum at the former Lowry base, not far from their house, and then we had lunch and went around the Denver Museum of Natural History and Science. There was a section on modern life where we could do health profiles on machines; Tim thinks he is not gaining too much weight on this trip — it’s possible that his clothes weighed 19 pounds, isn’t it? Or maybe there was something wrong with that scale, too, just like the ones at home. In the late afternoon we drove north. Outside Loveland, Colorado we encountered a tent full of brawny guys in tight jeans at a goose-calling contest. There was a tie in the team event, where two-man teams call geese simultaneously, working their geese callers together in a virtual symphony of honking, so they had to have a sudden-death overtime. Judges are supposed to judge only the sound of the calling, and how effective it supposely might be luring calling in a flock a flying geese. (How would the judges know?) But it seemed like the team that won were also the two guys who acted the most like geese, high-stepping back and forth across the stage and moving up and down as they honked away. Back on the road, we landed our little formation safely a couple of hours later in Red Feather Lakes, Colorado, where Uncle Bill and Aunt Shirley Janssen showed us where bears have scratched up the porch on their house. After the third time a bear came up on the porch to get at the hummingbird feeders, they decided they didn’t need hummingbirds all that much and took down the feeders. Odometer: 129 miles today; 3,508 miles for the trip. This was the middle of our three full days in Red Feather Lakes, and we continued to take it easy. Yesterday, Bastille Day, we went fishing; Uncle Bill and Aunt Shirley caught a nice mess of trout, Jonny mostly fooled around on the bank with a net and caught a crayfish and a snake and put them in a bucket (the crayfish won by decision for more punches thrown), and Tim caught some rays. In the evening we had grilled steaks and played horseshoes with Steve, Toni, and Nathan, and tried to figure out what kind of cousins they are and how far removed. This got more difficult as the evening wore on, and was abandoned when Uncle Bill got out his elk bugle to test the echos. Today was calmer: a hike through a beautiful stretch of woods and then down along the north fork of the Poudre River, and then to the bar in Red Feather village — one of maybe half a dozen buildings — for a cold one and some shuffleboard. After three full days in Red Feather Lakes, including yesterday when we helped the local hiking club blaze a new trail, we’re back on the road. We figure if we’re some place long enough to do community service, it’s time to move on. We went north into Wyoming and headed west, pit-stopping in Laramie and then having lunch in Rawlins, Wyoming and touring the old state penitentiary, which seems to be best remembered for allowing inmates to escape and lynch mobs to get in. We paused for the night in Rock Springs, Wyoming, after somehow finding and then having a dip at Firehole, an extraordinarily beautiful, isolated (three other cars there) canyon lake upstream from the Flaming Gorge Dam. Dinner was at the Bitter Creek Brewery, a great little brewpub in Rock Springs. Odometer: 358 miles today; 3,860 for the trip. It took us a while to get in — Jonny was more impervious than his dad — but we finally had a good soak, in and out for nearly two hours, at the famous hot baths in Lava Hot Springs, Idaho. 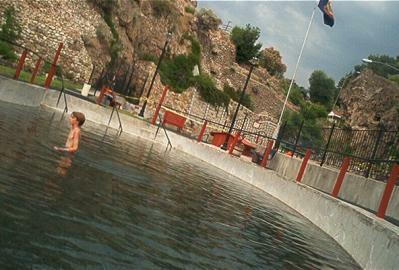 The temperature of the water in the state park pool where Jonny was standing was 110 degrees F. You’d sit or float or walk in it (gravel bottom) for a few minutes, til you were sweating and dizzy, and then lie on the side for a while til you felt normal, and then go back in. The beer and root beer tasted good that night. After a morning run along an I-80 service road with vultures swirling overhead, we spent much of the day on two-lane roads; on one desolate stretch, we didn’t see another car in our lane for 44 miles. We stopped lots, including at a rock/fossil shop and the original J.C. Penney store in Kemmerer, Wyoming, the Fossil Butte National Monument off Highway 30, the Oregon-California Trail National Visitors Center in Montpelier, Idaho, the man-made geyser in Soda Springs, Idaho, and the hot baths and diving towers (Jonny went off the lowest tower, 16 feet, several times) in Lava Hot Springs before ending up for the night with Bob and Penny Pink in Pocatello. They are scientists and she is owner/brewer of Portneuf beer, so we had lots to talk about. Odometer: 273 miles today; 4,133 for the trip. Odometer: 297 miles today; 4,430 for the trip. Today, Sunday, we drove into and out of South Lake Tahoe on scenic Highway 50, with a stop for a rocky climb partway up Mount Ralston. We were happy to be in Sacramento with Tony and Marybeth (Kerrigan) Bizjak and their lively kids, playing in their pool, eating their food, drinking their beer and wine, and especially listening to their stories — always the best part of every visit. Odometer: 670 for two days; 5,100 for the trip. Lizzie and Jonny, jet-lagged in her case and exhausted in both cases, pose on Jones Street above San Francisco Bay after a heavy day of tourism, a big restaurant meal and much climbing of hills. Some of the lights in the background are from Alcatraz. 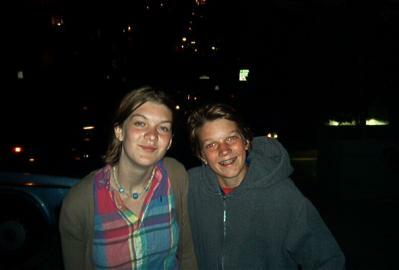 Today, Tuesday, we dipped into Golden Gate Park, strolled and shopped Haight Ashbury, bused to Aquatic Park, and then walked to Fisherman’s Wharf, where Jonny showed Lizzie some of the territory he and Tim had covered the day before, on their first afternoon in town. A ferry and lunch in Sausalito, then back for dinner at Contadina’s with Mel, Deirdre, Nancy’s sister Chloe, who was glowing, and her partner Jane, who is glowing vicariously. Guided by Mel and Deirdre, we somehow managed to walk several more sets of hills to some secluded and spectacular nighttime views of the city and the bay far below. A beautiful evening. 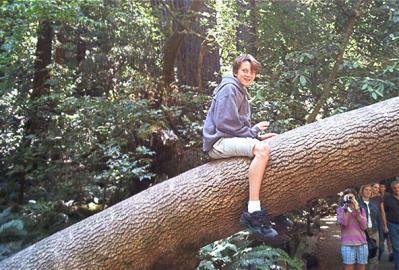 Here’s Jonny shinnying across a live tree — a twisty-growing maple, not a redwood — at Muir Woods in Marin County. Muir Woods was one of Nancy’s strong recommendations, and we’re glad we did it: majestic, serene, powerful, the place made quite an impression. Mel and Deirdre took off today and spent a great day with us. They took us across the Golden Gate Bridge to Muir Woods, which is about the seventh National Parks monument we’ve visited. Maybe more. After a great walk through the giant redwoods — their roots go only 10-12 feet deep even though they can be 300+ feet tall — we drove along the coast to Stinson Beach, a beautiful sandy strand in Marin County where we had sandwiches, soda, tossed around a football, read, dozed, etc. After checking out the views high above Golden Gate Bridge on the way back, we stayed out of Deirdre’s way while she cooked for us, and Lee and Bridget. Why are the food and the talk both always so good in San Francisco? We had goodbye hugs with Mel and Deirdre in San Francisco, and turned the trip south. Down the Northern California coast to Monterey, where we spent most of the day in the Monterey Aquarium. Then we went inland for 16 miles to Salinas, the John Steinbeck Museum (this was his birthplace) and the home of Albert and Gayle Maldonado. We went out to dinner with Gayle and Albert and two of their kids and one of their grandkids at a Mexican restaurant where Bill Clinton once pulled over his motorcade just because the place looked good (he was right). 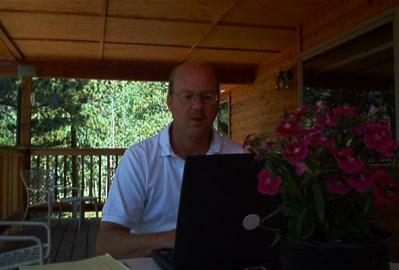 Later, over Carmel microbrews, Judge Albert and I set up our laptops side by side on the kitchen table. Odometer: 153 miles today; 5,403 miles for the trip. From Salinas, we wound our way down California Highway 1, one of the few long two-lane routes in America that seems to keep getting better. We cruised in and out of quainter-than-heck Carmel, and stopped maybe a dozen times in 50 miles to take photos or just gaze at the spectacular views — probably the most dramatic meeting of land and sea (land and see) in America — before we got to San Simeon and the Hearst Castle, where we spent the afternoon. Hearst kept his mistress there for many years, but disapproved when unmarried guests had liaisons. He also was afraid people would think poorly of him for having so many European statues of nudes on the grounds, so the Marx brothers tweaked him by running around in the middle of the night putting clothes on all the statues. We had dinner at the famously over-the-top Madonna Inn in San Luis Obispo, thanks to a recommendation from Aunt Chloe. And we spent the night in a motel outside Los Alamos. Nothing glowed in the dark, especially us. Odometer: 244 miles today; 5,647 for the trip. Yesterday we blasted into Los Angeles — hey, LA, another perfect day — and checked into a little, low old airport motel that was probably built around the time the airport opened. Very Mexi-Cali, lots of open breezeways and and grates and climbing vines, clean, good service, and cheaper than any motel since Jackpot, Nevada. We spent the afternoon at the Warhol retrospective at the Museum of Contemporary Art (who’s cooler than us?) and then picked up Nancy at LAX. She said the cabdriver who took her to Newark airport from Ridgewood was talking about how every week he reads a report in the local paper from a fireworks-crazy kid who’s traveling around the country with his dad. That’s her little pyromaniac, Nancy proudly informed the driver. The four of us, together for the first time since school got out in June, had dinner at an Air Force-themed restaurant near the motel. Back at the room, I had a cigar on our balcony overlooking the poolside, where the traveling (from Ohio, most of them) Wilson family reunion was loudly debating what kind of pizzas to have delivered for a midnight snack. Wilsons and pizzas came and went into the wee hours, often loudly, often right outside and below us, but we were too tired to hear them. Today, Sunday, we toured the La Brea Tar Pits (it’s really asphalt, not tar, but the paleontologists have stopped trying to convince people), then took a look around the Claremont colleges and finally drove down the coast past all those beautiful beaches. Oh, to have one of those houses in DelMar. We cruised through San Diego and across the bridge to Coronado, where we’re staying with Mike Marrinan and Sue Finlay and their energetic dogs. Dinner was at a coolly stylish waterfront Italian place with good food and the skyline across the bay. Then a brief stop at a brewpub to pick up a growler (no, that’s not another dog) and a nightcap at the hacienda. The secret to not getting homesick on a long trip? Bring the whole doggone family (at least for a while). Odometer: 381 the last two days; 6,028 for the trip. 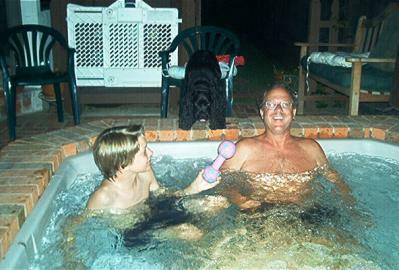 In the backyard Jacuzzi in Coronado, one of Mike & Sue’s dogs, Wendy, kept dropping the bone in the tub. We were expected to throw it, and we tried to be good guests. Now this was a vacation day. We woke up late to perfect weather. I went for a long run, we spent the afternoon on the beach outside the Hotel Del Coronado, strolled the San Diego Zoo during its new summer-evening hours, and had salads and shrimp-pesto pizza for a late supper. We ended the evening in Mike and Sue’s hot tub. It was all very California. Nancy and the kids went with Susan to Balboa Park in San Diego, and I went to the beach in Coronado for a swim and a read. We cleverly timed our departure to hit rush hour in several California cities, and we didn’t exactly avoid the heat of the desert (up to 109 degrees, even after the sun went down), but we still made it to Las Vegas in good time. We tried to get rooms at several older casino resorts (Imperial Palace, Riviera, Tropicana, etc.) but they were all full. Las Vegas is jammed with people. Partly because of the economy, partly because of security fears, this is the year of the road trip in America, and it looks like all roads lead to Las Vegas. We finally ended up at the Stardust, too tired to do much of anything. Odometer: 347 miles today; 6,430 for the trip. 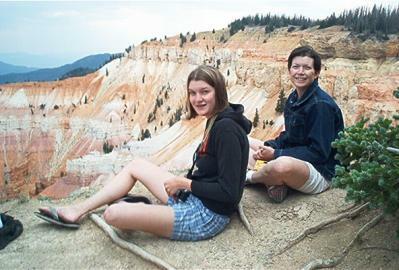 Lizzie and Nancy, who are decorating the trip through the Southwest, take their ease in southern Utah on the rim of Cedar Breaks, high above the incredibly spectacular and colorful rock formations in the canyon far below. Cedar Breaks is a national monument, but is not well known, probably because while its geological formations are almost as spectacular, it is smaller than Bryce Canyon, Zion National Park and, of course, the Grand Canyon, which are all within easy driving distance. Jonny and I hit the pool, and we all hit the Stardust buffet — hard. Back on the road, we went north through Nevada, sliced off a corner of Arizona and plunged into Utah. One of our stops was at the former ghost town of Silver Reef, being reborn around an art gallery, museum and extravagant houses built by Mormon retirees from Salt Lake City and southern California. After a stop for ice cream and groceries in Cedar City, Lizzie drove part of the way, both on the Interstate (75 mph speed limits) and smaller roads up into the mountains (grade 13 percent) to Sue and Mike’s condo at Brian Head, a beautiful ski area in Utah. We’re enjoying the offseason quiet and clean piney air, though we are having trouble sucking in enough of it here at 9,400 feet elevation. Odometer: 204 miles today; 6,634 for the trip. We are enoying life at altitude. Jonny has been using the big sky to fly a kite every chance he gets, all four of us have done some hiking, and Jonny and I have gone mountain biking twice. I have the scars to prove it: two rides, two face plants. Nancy says my nose, which served as a landing gear for the first one, is so red and swollen and scraped and scabbed that it looks like one of those old fat drunk noses. We spent much of today at or near Bryce Canyon, trying but failing to make our many cameras do justice to the scenery, and then scrambling and hiking up into the Painted Indian Hills in Red Canyon, just outside Bryce. Bryce Canyon, incidentally, is named after a Mormon settler. For a time, the canyon, with all its majestic and colorful rock spires and other formations, was in his back yard. When people said it must be wonderful to live there, Farmer Bryce complained about how much trouble it was any time he had to look for any of his cows that wandered off into the maze of formations. This was a little different day than the one we had planned. The original idea was to drive 161 miles from Brian Head to the North Rim of the Grand Canyon, check into the Grand Canyon Lodge, and meet Nancy’s brother Pete, his wife Kim and their two boys after they drove up from Phoenix and set up camp. The plan was to have dinner and tell stories around the campfire. Pete had even bought me some Fat Tire beer to lubricate the storytelling. But Pete and Kim and the boys had an accident on the way up on Friday afternoon. They were OK except for bumps and bruises, but their camper trailer was totaled and their SUV was not driveable. They were stranded in a motel in Kanab, Utah, and needed to rent a vehicle to get back to Phoenix. So instead of going straight to the Grand Canyon, we stopped in Kanab, Utah (it was on the way). We left our kids at the motel with Kim and their kids, and Nancy and I took Pete to pick up a rental car. Without going into a lot of detail about imperfect and incomplete information from insurers and car rental agencies, we ended up driving back and forth across southern Utah, 80 miles west from Kanab through Mt. Zion National Park and its majestic canyons, to St. George, where it turned out that there were no rental cars at any agency. So we turned around and drove 160 miles east back through Kanab to Page, Arizona, where Pete finally scored a small SUV — apparently the only vehicle of any kind for rent anywhere in southern Utah that he could return in Phoenix. One of the interesting footnotes of the trips back and forth between Arizona and Utah looking for rental cars was that the normally taciturn Pete, apparently feeling the need to entertain us in compensation for chauffeuring him around, tried to make the time pass more quickly by telling us stories, anecdotes, facts, factoids, and what may even have been a joke or two. And his patter worked; it did make the time go more quickly and pleasantly. Anyway, we finally made it to the Grand Canyon Lodge, both families. We doubled up in the rooms we had rented, had a nice dinner, sat out on the terrace overlooking the canyon, watching the distant lightning and the shooting stars, and had a great evening. Odometer: 478 miles today; 7,330 miles for the trip. 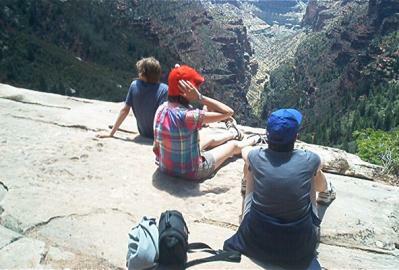 Here’s the rest of the family at a nice viewing spot — about 3,000 feet above the Colorado River — on the North Kaibab Trail over the Grand Canyon. This was right before the kids lay down and acted like they were asleep in the hopes that we wouldn’t make them hike down any farther; after all, every minute walking down meant two minutes walking up. Pete and Kim and the boys left the Grand Canyon early. We stayed another day to visit scenic overlooks and hike some of the trails. It involved a lot of driving on steep, twisting, narrow mountain roads, often with sharp dropoffs on both sides. So we put Lizzie behind the wheel. Lizzie and her learner’s permit did fine, but afterward both she and Nancy, who rode shotgun, said they needed a nap. I needed a beer. But it wasn’t because of Lizzie’s driving. I think alptitude creates a powerful late-afternoon thirst. In the evening we rewarded our hiked-out selves with a great dinner at the Lodge. The North Rim of the canyon is definitely the way to go — so relaxed, so quiet, so relatively uncrowded. A final note about the Grand Canyon. A ranger told us that kids never fall over the edge. It’s always adults, and 75 percent of them are males — nearly all of them either showing off or trying to get a perfect picture or both. We’re happy, we must admit, with our cowardly pictures. Lizzie kicked off a long hard day of travel for us by taking the first hour, down those twisting roads from the Grand Canyon to breakfast in Jacob Lake, Arizona. We cut south on a well-traveled two-lane highway past the Vermillion Cliffs in Arizona, then turned east on a smaller state highway across the Hopi and Navajo reservations. We stopped at the historic trading post in Hubbell, Arizona, where a National Parks ranger told us her father and other Navajos who had been Code Talkers in WWII didn’t like the recent Nicholas Cage movie “Wind Talkers.” She said the film used only one Navajo actor, and the Canadian Indians who played Navajos mispronounced many of the Navajo words. She also said that scenery (the movie apparently was filmed largely in Hawaii) didn’t represent the “hell” the men remembered and, finally, the surviving Code Talkers said they never had anyone assigned to take care of them or watch over them, as in the movie. We dipped onto old Route 66 (the quintessential road trip of my youth) to Gallup, New Mexico, where we had dinner (Mexican food and Navajo lamb stew) at the Eagle Cafe, recommended in the Sterns’ “Road Food” series, and stopped to look around the lobby of the venerable El Rancho Hotel-Motel, with its old-style western decor and the autographed photos of the many movie stars of yesteryear who stayed there when making movies, mostly westerns and “Arabian” films, in the desert not very far out of town. We drove through Albuquerque and ended up in Rio Rancho with Stan Hieronymus and Daria Labinsky, whose soon-to-be-former house (they were in the process of moving) has a great nighttime view of the Albuquerque city lights strung out for miles below. Odometer: 524 miles today; 7,889 for the trip. New Mexico is a really interesting state. After checking out Stan and Daria’s new house (and the reverse sticker shock, compared with Eastern housing prices) outside Albuquerque, we drove up to Taos Pueblo, the World Heritage site where the Taos natives have preserved their village, their culture – and, to a large extent, their way of life – for 1,000 years. Some things have changed, of course. Visitors have to pay $20 to get into the village, for example, plus $10 if they want to take photos. And, amid the tribal artists and elders and others selling arts, crafts and locally made food such as frito pie and fried bread, we saw a little girl, maybe three years old, making mud pies and showing them to tourists. “Two dollars each,” she said. She seemed to be making a good living for a three-year-old selling water and dirt. From Taos we drove back south to Santa Fe, which lived up to its reputation for art, artists and being laid back – except for the “peace rally” in the center square that featured a young guy with a mike issuing a shrill screed against just about everything. For example, he informed us that the U.S. government developed AIDS as a “de-population” strategy. He was followed by a band that attempted a psychedelic version of The Star-Spangled Banner, but it didn’t remind anyone of Hendrix. No matter. We window-shopped and strolled the streets amid lots of seemingly relaxed middle-aged and elderly people with long graying hair, both men and women, and then had a great dinner at a place recommended by Stan and Daria. Odometer: 338 miles today; 8,227 miles for the trip. We zoomed across the rest of New Mexico into Texas and the Central Time zone for the first time in weeks. Crossing the Panhandle overland (off the Interstate), we asked Nancy’s sister Amy where we should eat. “Any place that looks like a hole in the wall should be good,” she advised. We stopped in tiny Hedley, Texas, at the Hedley Cafe, which qualified on both counts. (BLT, grilled cheese, two chicken-fried steak sandwiches, and iced tea served in glasses it took two hands to pick up). We got to Amy’s place in Wichita Falls in time to drink beer under the mulberry tree in her front yard with her friends Janelle and John, who had some interesting stories to tell, some of them possibly true. Aunt Amy stuffed Jonny and Lizzie into the air intake of an F-16 when she took us around Sheppard Air Force Base. You should have seen Lizzie trying to climb out. 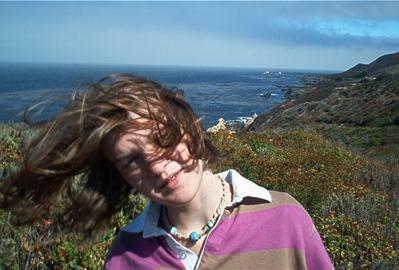 “That would be one of the worst places in the world to be when that jet engine is turned on,” Amy said later. We left Amy’s kids home get the dinner Amy made for us on the table (barbecued beef and Texas caviar — excellent), and went just down the road to Sheppard AFB with Sgt. Amy — former, actually, now that she’s retired and has become a civilian instructor doing pretty much the same job, training USAF mechanics to keep fighter planes in the air. You could see the change in Amy from the time she put her beer down in the front yard to when she swaggered into the F-16 hangar, shoulders swinging as if she were still wearing her uniform and stripes instead of pedal pushers and a summer blouse. The younger instructors, many of whom she trained years before, snapped to when they saw her, and you could see the deference, the respect, and maybe a little fear in their eyes. 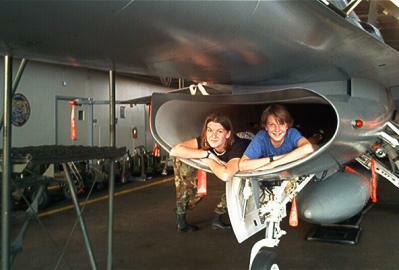 Amy showed us around the base, and she and Jonny and Lizzie climbed and clambered about a variety of multimillion-dollar weapons of destruction — a C-131, an F-16, an A-10, among others. We will all feel safer when we go to bed tonight. Odometer: 397 miles today; 8,624 miles for the trip. A long hard driving day but tomorrow, as Paul Simon sang, we all will be received at Graceland. We took two-lane roads most of the rest of the way across north Texas. When we stopped for gas in Paris, Texas, which is actually one of the bigger towns in that part of Texas, pop. 20,000-something, the clerk who took the money asked where we were from. I told her, and asked if she had seen our license plate. “Nah,” she said. “Y’all just look like Yankees.” We had lunch — enchiladas, fried okra, cornbread, beans, cole slaw, cake and iced tea — at Mamaw’s, a roadside fiberboard shack with a corrugated tin roof outside some little town whose name I can’t recall. The regulars had nicknames like Peewee and talked a lot about whether somebody’s granddaughter was going to be able to get into cosmetology school. We imagined that we were the topic of conversation at all four other tables as soon as we paid up and left. We made better time than we expected to get to Memphis, so we checked into a hotel, took showers, shaved if necessary and then hit the town for barbecue at Rendezvous, one of the South’s best and best-known rib joints. Then we walked up and down Beale Street, pausing to listen to the various blues bands playing outside bars or inside next to big open windows, and to soak up the other necessities of life — sweets, beer and souvenirs. Odometer: 550 miles today; 9,174 for the trip. 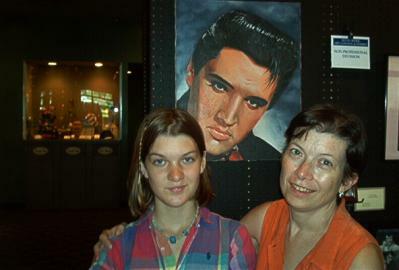 We learned at Graceland that Elvis still looks down on us all, but it was more than symbolic for Nancy and Lizzie at one of Graceland’s many gift shops on their last full day of the trip before flying home and rejoining the real world. Memphis is not a pretty town, but it has some nice spots, and the downtown has a great feel. We spent most of the first part of the day at Graceland. It was interesting, even the gift shops at every turn. We bought the family photo of us in front of the wall painted to look like the front gates. Here’s a bit of trivia: What was Elvis’ favorite nickname for Lisa Marie (the daughter, not the plane) when she was a kid? Choice: A. Peanut. B. Yiza. C. Buttonhead. D. Hound-Puppy. If you have a guess, or if you know, send a note to the comments section. In the afternoon, after lunch at the Arcade, a classic old diner, we went to the National Civil Rights Museum, built around the old Lorraine Motel, where Martin Luther King was shot. This is a really good museum, and it tells both the big stories and lots of smaller, more human stories. We spent most of the evening at Autozone Park, the new-old baseball park downtown, a few blocks from our hotel on Court Square. We watched a AAA doubleheader, or most of it, between the Memphis Redbirds and the Nashville Sounds. My favorite player is the Redbirds’ second baseman, Stubby Clapp, who his first time up smacked a homer into the picnic area beyond left field. It send the kids scrambling. I hope he makes the majors someday. Passing through the lobby of our Memphis hotel early this morning, I saw a young guy sitting in the lobby, looking apprehensive. He had a couple of big bags, including one with “Pirates” on the side. It wasn’t til a few minutes later, while jogging along the banks of the Mississippi, that I thought about it and decided he was probably a member of the Nashville Sounds, Pittsburgh’s Class AAA affiliate. The team was staying in our hotel after a late doubleheader against the Memphis Redbirds; the best reason one of the players would be sitting in the lobby at that hour would be that he was being sent to another team in the Pirates organization. Maybe he was being called up to the majors. We have initiated lots of conversations with lots of strangers during this trip, and I should have talked to this guy to get his story. After my run, I looked for him in the lobby, but he was gone. And we didn’t see any other Sounds players or coaches before we checked out. Nuts. Meanwhile, Elvis has left the trip, and we have left Memphis. After pausing outside Bucksnort, Tennessee, to switch drivers and let Lizzie rack up 60 miles and nearly and hour of heavy 70mph driving on Interstate 40, we sailed into Nashville with just enough time to have lunch at the Pancake Pantry, a longtime institution and a mecca for road foodies. We had cornbread pancakes, peach pancakes, sweet potato pancakes and a BLT. Then, sadly, Jonny and I put Nancy and Lizzie on a plane for home. They weren’t with us long enough. But it took about 3.5 miles for Jonny and men to fall back into our established patterns of the road trip. In short order we got the Volvo’s oil changed for the third time on the trip, toured the Hermitage and the Andrew Jackson museum, and put a lot of miles behind us. We were just starting to look for a place to stay when we drove past a dragster raceway. We took the next exit, for Crossville, Tennessee, and drove in the general direction of the dragway across country roads til we found it. We joined an extraordinary array of juiced-up cars, ranging from flame-belching rail dragsters with parachutes to family station wagons. (No, I wasn’t tempted. Though there was a pregnant woman driving an old Buick sedan at speeds up to 62 mph for the quarter mile, compared with up to 165 mph for some of the dragsters.) We spent a couple of hours with our fingers in our ears (veteran fans brought their own earplugs) and breathing a mix of gasoline fumes, nitrogen-fuel exhaust and the black smoke from squealing tires laying rubber. The announcer kept saying, “Ain’t that a purty car?” Afterward, it took me an hour to regain my hearing and recover my normal heart rate. Jonny, the gearhead, loved it so much and was so grateful to me that when we finally found a motel he got out his clarinet and practiced with only a few complaints. Odometer: 357 miles today; 9,539 for the trip. 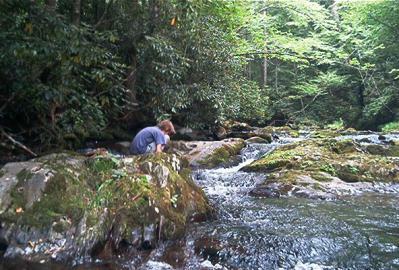 Jonny is looking for the perfect stones to make a little dam on Collins Creek, where we stopped to wade and cool off as we drove over the mountains at Great Smoky Mountains National Park in Tennessee and North Carolina. We slept late after all the drag-racing excitement, and didn’t get on the road til 10 o’clock. It was a long day, made longer by driving through Gatlinburg, Tennessee and into Great Smoky Mountains National Park — but we’re not complaining. One of the highlights was stopping at a creek to cool off. We drove all the way over the mountains into North Carolina and Cherokee, the town at the heart — commercial if not otherwise — of the Indian reservation. We found our way to Cyndy and Gary Gunther’s place in Concord, North Carolina just in time to have a traditional Southern supper (Yankee version: the chicken was grilled, thankfully, instead of fried) and visit with them, a couple of their daughters and the little grandson who is clearly the prince of the castle. Odometer: 380 miles today; 9,919 for the trip. I got up early, had a cup of tea with Cyndy, and saw her off on a case. Gary was going to hang around and talk, but suddenly he got called off on a case, too. Did I mention they are private eyes? So Jonny and I made our way out of Concord on back roads, getting lost a couple of times but finding our way to Level Cross, North Carolina and the King Richard Petty Museum. We could hear engines being revved in the nearby motor-racing workshops, but the museum was mostly a gift shop. It was sadly moving, however, to find, in the back corner, a subdued memorial to Adam Petty. 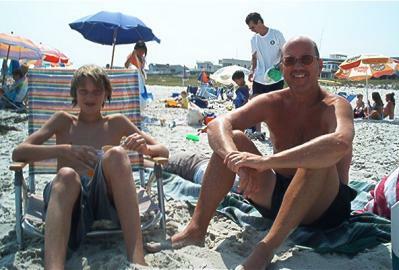 He was the fourth generation in the NASCAR family dynasty — great-grandfather Lee, grandfather Richard, father Kyle before him — when he died in a crash at age 19 in 2000. We also stopped along Richard Petty Highway in Randleman, North Carolina for a plate of barbecue, including hush puppies, turnip greens, cole slaw and very spicy baked beans, at the Blue Mist roadhouse. Counting the leftover chicken for breakfast, it was our third meal of barbecue in a row. In Greensboro, we were surprised and pleased to find tht the Sky magazine crew, my favorite editors, had arranged for us to stay in the pool house of the ambassador to Finland (Bonnie Hunter, who owns the parent corporation). Tres chic. We went to a Greensboro Bats Class A game that night, drank Red Oak on tap and had a great time. Mickey showed me a clip: a Nashville Sounds player had been called up to the Pittsburgh Pirates on Saturday morning (see Memphis entry above), had pitched in relief in San Francisco that day, and had gotten shelled. Now I really wish I had talked to the guy that morning in the lobby. Odometer: 107 miles today; 10,026 for the trip. 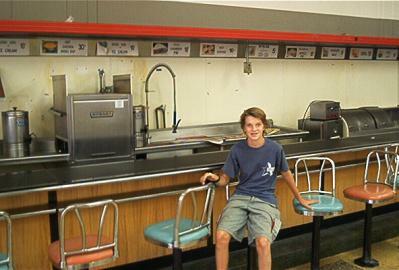 Jonny is quite a bit more relaxed at this old Woolworth’s lunch counter in Greensboro, N.C., than four freshmen from North Carolina A&T were on Feb. 1, 1960, when they slipped onto stools and asked to be served. The were arrested, of course, but their actions started the sit-ins at lunch counters and other nonviolent protests across the South in the 1960s. Amid a national uproar and local violence, Woolworth’s desegregated this lunch counter a few months later. It is going to be part of a new civil rights museum. After another great day in and around Greensboro — a tour of the nearby Guilford Courthouse battlefield and museum, a fascinating afternoon at the museum being created around the Woolworth’s where the lunch-counter sit-ins began in 1960, and barbecue sandwiches with Sky colleagues at the Pink Pavilion (the pool house) — we reluctantly continued east across easter North Carolina. 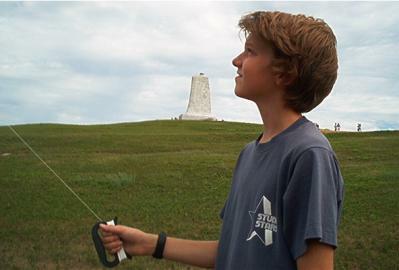 Jonny flew his kite near Kitty Hawk, N.C., at the base of the hill Orville and Wilbur used as a runway for their first Flyer — little more than a motorized kite itself — back in 1903. That’s the national monument to the Wright Brothers on top of the hill. flew it at the base of the hill where the Wrights launched their first flights. Back in Nags Head, we swam and boogie-boarded, and then had a great evening of seafood and talk with Mitch and Christine (Pitsch) Lively, her parents Bob and Helen, and some friends. We sat up too late with good wine and the local microbrew on the roof of their place, the Morales Gallery, talking about high school, art and life choices, and some of us smoked cigars on the deck. We looked in vain for Perseid meteors, but settled happily for some of Jonny’s fireworks — until the local cop came by. Odometer: 316 miles; 10,342 for the trip. We turned north with a vengeance for the first time on the entire trip, rounding into the home stretch. Up into Virginia, we stopped at Fort Eustis, and checked out the new living history museum at Endview Plantation near Newport News. Even with another stop in Williamsburg for go-karting, we somehow got to Falls Church an hour or so before Cheryl Arvidson, my first and still best boss ever, got home from work, so we went bowling. (Regular bowling, that is; the duckpin alley wasn’t open yet.) We had a much-needed relaxing evening with Cheryl and her cats — relaxing for us, anyway, if not the cats. Odometer: 311 miles today; 10,653 for the trip. We apparently weren’t meant to visit the Holocaust Museum today. First we went right past it looking for a parking place, and ended up driving back across the Potomac to Virginia. We stopped at Theodore Roosevelt Island, a little national park in the middle of the river, and regrouped for another invasion of the nation’s capital. By the time we got back to D.C., the streets leading up to the Holocaust Museum were all being closed for the funeral of a park ranger who had been killed by a drunk driver. So we gave up on the Holocaust Museum and sleuthed our way to the new International Spy Museum, the first big private, for-profit museum in Washington. Despite all the other Washington monuments and museums that are free or nearly free, people are standing in line on the sidewalk to pay $11 apiece ($9 for seniors, military personnel and the intelligence community) to go through the Spy Museum. It’s apparently shaking up the professional museum community. And it’s worth it. We were there for three-plus hours, which is a long time for two guys who have been to a lot of museums over the past two months. We got to Baltimore too late for the museums on the Inner Harbor, but not too late to walk around, hang out, and rent a paddle boat that we steered right up next to a submarine. (Permanently moored there; it wasn’t like we chased it down in our paddle boat.) We drove north a bit and spent the night in a motel in Edgewood, Maryland. It was our last night of the trip in a motel, and 11th total, as we started our eighth week on the road. We meet Nancy and Lizzie and Aunt Judy at Barnegat Light tomorrow for a week of relaxation — and as little driving as possible. Odometer: 105 miles today; 10,758 for the trip. Heading north on two-lane roads, we went through Aberdeen, Maryland, and found the Ripken Museum. The staff was hanging out in front — nobody had a key — so I went down the block and got a haircut. The barber bragged about how he used to cut Cal Jr.’s hair when he was in middle school, and cut Cal Sr.’s hair up until he died. Some of the hair he cut from Cal. Sr.’s head was used on the life-sized wax figure of Cal Sr. in the museum. He even stopped in the middle of the haircut — this with a room full of guys waiting, none of whom seemed to mind — to dig out some old Ripken family photos for me to examine. After my haircut, Jonny and I went back to the museum, and the staff was still waiting for someone to bring them a key. We suggested they try the barber shop and then pushed off. We’ll have to save waxy Cal Sr.’s shorn locks for next time. We made our way slowly through the Pine Barrens onto Long Beach Island, and met Nancy and Lizzie and Aunt Judy at the house we have rented for the week in Barnegat Light. We swam, walked on the beach, drank champagne and had not one but three bithday pies for me. Odometer: 148 miles today; 10,906 for the trip. A house three doors from the ocean at Barnegat Light was just the ticket for re-entry. It got us used to sleeping in the same place, being able to open the fridge without asking someone, and cleaning up after ourselves. It was like a halfway house for integrating us back into society. Plus the water was warm and the waves were good. Sleeping til eight, a leisurely run, fruit for breakfast, reading on the beach, some gentle wave-jumping and body-surfing, a beer in the outdoor shower, fresh vegetables and fish from the grill for dinner at the picnic table on the deck, a walk on the beach under a full moon — I guess there are worse ways to end the trip and prepare for re-entry. Speaking of re-entry, the tiny crack in the Volvo windshield, apparently from a pebble on a Tennessee highway, is no longer so tiny. Besides getting the car detailed, I’m going to have to get a new windshield. But that’s next week. For now, back to the beach. We talked about the trip most of the way back to Ridgewood. We turned in the driveway at 1:53 p.m., and shook hands and then hugged before we got out of the car. We owe a huge thanks to all of the people who hosted us along the way, and to those of you who emailed us, called us, and posted notes under the Your Comments section here. (It’s not too late to post a comment, by the way. Feel free.) We also owe a huge debt to Nancy and Lizzie for making it possible for us to take the trip in the first place. Nancy sent a man and a boy out onto the road, and I brought her back…two boys. Finally, I have to thank Jonny for coming up with the idea for the trip, for prodding me to commit to it, and mostly for being such a great traveling partner. Odometer: 120 miles today; 11,070 miles, final total for the trip.